Let me just start by saying YUM! This recipe is so tasty you'll want to eat it every week if not more! 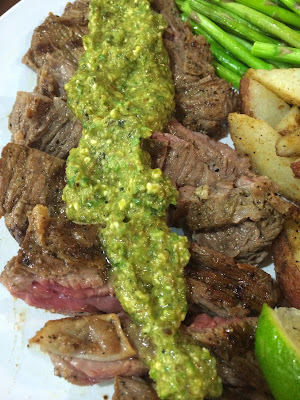 My husband is from El Salvador, and grilled skirt steak, or carne asada, is probably his most favorite food in the world. 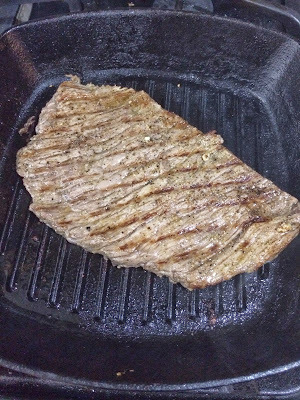 It is a thin stip of meat found on the underside of a cow, and there is only 1 skirt steak per cow, so it is sometimes hard to find, but it is insanely cheap at about $6 per pound. I usually buy a few at a time to keep on hand for a quick meal. A marinade and a quick high temp sear is all you need to make this delicious steak in your house. It can be served with rice, potatoes, any veggie, or in a taco or burrito, and with this creamy slightly spicy poblano pesto you really can't go wrong, the combinations are endless! 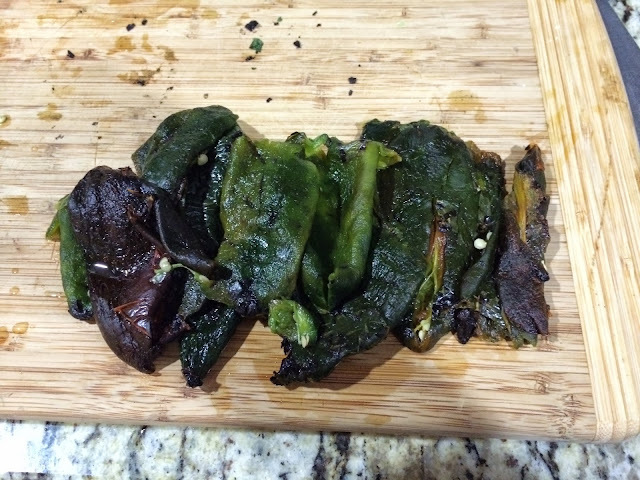 2 large poblano peppers, roasted, skins removed and diced. Your meat should marinate for 4-6 hours to break down the tissue and infuse flavor. 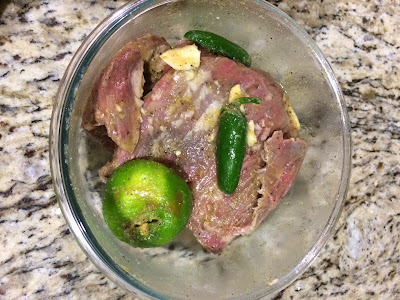 You'll want to squeeze your lime juice and throw in the lime, smashed garlic, halved pepper, seasonings and olive oil into a large bowl, or ziplock bag, add your meat, give it a shake and refrigerate. Take out about 20 minutes before cooking to come to an even temperature. 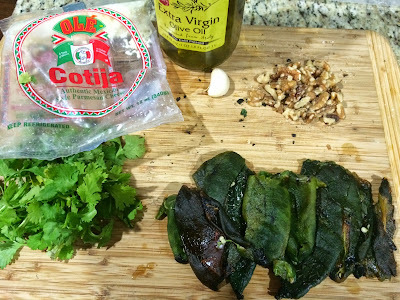 While that is happening, make your poblano pesto. I harvested the last of my peppers earlier this week, so I had lots of little baby poblanos, so that's what I'm using, but the equivalent of 2 large peppers is what you're after. Remove the seeds and stems and dice. Assemble all of your ingredients, you'll be putting them into a processor or blender together. I used walnuts because at the moment they are my favorite nut, but anything you like will work. Process all of your ingredients, except your olive oil, until it's nice and smooth, then drizzle in your olive oil until it is a nice consistency, tasting to make sure it doesn't need anything. 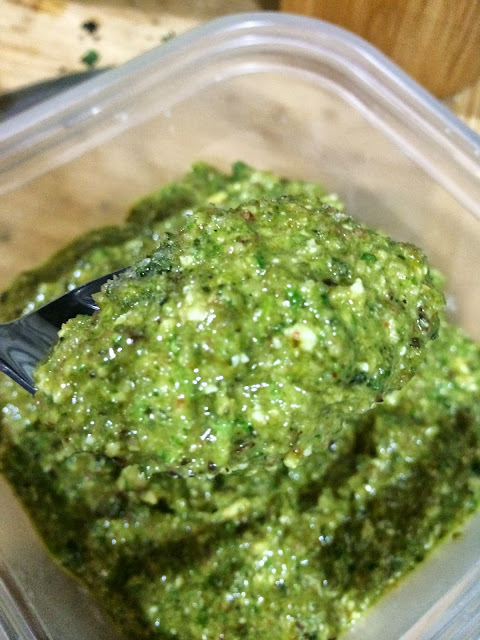 This recipe made about 1 cup of pesto, which will keep in the fridge for a few weeks, or you can freeze it! 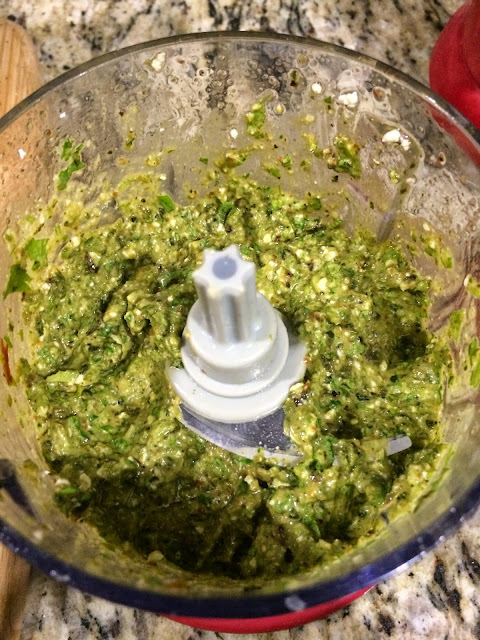 This pesto would be a great addition in tacos, burritos, mixed into guacamole, in your scrambled eggs, smeared in a sandwich, the options are endless! Now to the steaks, take your steaks out of the marinate and wipe off any excess liquid, and chunks of garlic. You'll need to get your grill pan smoking hot, so if you leave garlic on it will burn, and excess liquid will steam not sear. I seared 2 minutes on the first side and just 1 minute on the second side and took it off the heat. It was medium-rare, you can do an additional minute for medium-well, but anything beyond that will be tough. 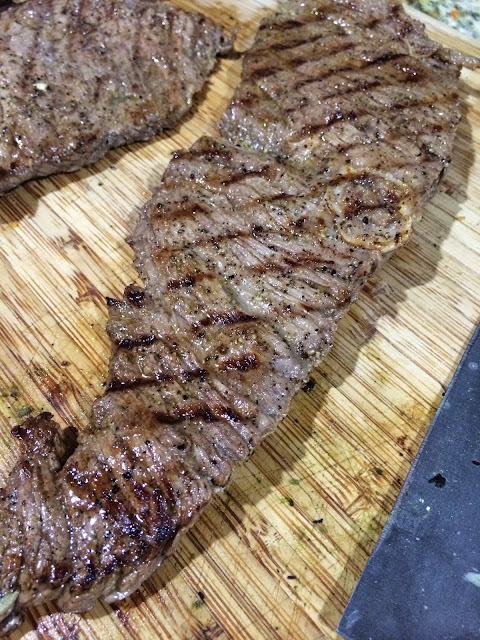 Let your meat rest for 10 minutes before slicing, and then slice it against the grain of the meat. This is the key to a tender fall apart steak. This is also not optional, do it! I topped my steak with the pesto, and typical of my husbands style, some extra lime slices on the side. 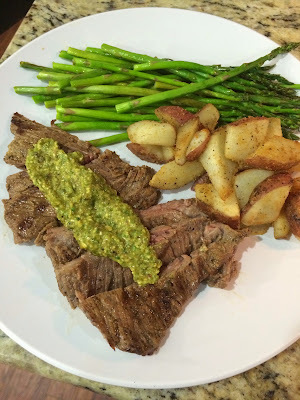 The pesto was also delicious with the roasted red potatoes I served on the side. Make this, enjoy this and love this!